Chapter 10 – Trees, Chutes, Steeps and Cornices. Student ‘Tom (TC)’ takes his first Cornice! AND lands it! Steeps are slopes steeper than 40 degrees. Most steep black runs are under 30 degrees to put in perspective. These are the runs that when you stand at the top you can’t even see if there really is a run or not. I must admit that really steep slopes are one of my favourite things, some thing to do with adrenaline I think :) . Any way steep slopes are not so hard on skis, a bit like skiing on ice easier for the skier than the boarder. The technique for these steeper slopes is called a jump turn or pedal turn and is a development of our jumping around the pole technique. The problem with our jumping around the pole technique is that although fine for black runs you just don’t get the skis around fast enough for these steeper slopes. The key is to use you uphill ski as a launch pad and push down with you up hill leg whilst ‘pedalling’ up with you down hill leg. This sounds complicated but is quite natural, a simple pedalling action. Once you have pedalled you retract both legs and spin your ankles to turn you skis. The amount you spin you ankles depends on the steepness of the hill. If it is really steep then you can spin them 180 degrees or if it is not so steep just 90 degrees and carve the rest. You can see what I mean by practising on the bottom step of some stairs, stand in a skiing position on the bottom two steps, one foot on each step, shoulders facing down hill. Now push off (jump) from you up hill foot and retract both feet and turn them 90 degrees and land on the floor. This should be a Cat like operation and you should land quietly ( Don’t worry people will think you are mad, this is normal, just think, I bet they are a snow plougher!). This new advanced jump turn still uses the same pole plant, supporting your weight as you jump. You can also use your milking the giraffe outside arm jerk if you are having difficulty getting off the ground, but don’t make this you style save it for emergencies. Another problem with these extremely steep slopes is starting your first turn. It is very hard to do a jump turn from a static position, you need some of the energy from the previous turn to help you but you haven’t turned yet. The key is to side slip just a little bit and then do a little stop. This is just like the end of a turn and will give you the spring that is required. Next Chutes, chutes are steeps with walls (Great I hear you say!) and demand a little more care. There isn’t a lot to add other than make sure you finish your turn with you shoulders facing down the chute. This ensures that you don’t go sideways at the end of your turn (in to the wall!). If it is really very narrow and you can’t get a jump turn in then it is ok to use the snowboarders trick of side slipping, really if they can do it so can we! Another tip is, focus on the gaps not the rocks, you ski in the direction that you are looking, so don’t go there! At the top of a lot of chutes and bowls are cornices. Large build-up’s of wind blown snow, I remember looking over my first cornice and thinking there is no way anyone can jump off that. Years later when I did eventually try my first cornice entry I was most suprised at how easy it was. The key to cornice entry is that they always look higher than they are. Because cornices are usually on the ridge of a slope when you look over it looks like a sheer cliff but when you get underneath and look up it looks like nothing. The reason that we can jump off things on skis and not feel a hard landing is because the impact of landing is spread over more time. This is a bit like a skiing air bag, we decelerate slowly due to our forwards movement. There are three ways to ski over a cornice, straight, slide in, and aeroplane turn. Lets start with the easiest, sliding in. This is where you almost side slip down the front but at an angle diagonally across the front in a traverse. From a stand still with your skis across the slope just edge forwards a little and diagonally slip across the front of the cornice. This sounds drastic but you will be amazed at how this works. I used this technique for a couple of years before I dare try any thing else. The only down side with this method is that it only works on wide slopes. If it is very narrow you haven’t got room to slide diagonally across the cornice. For narrow cornices you need to use the aeroplane turn. This works well when the cornice leads to a steep smooth cute. It is called the aeroplane turn because you actually turn your skis in the air. This is how it works, this time start with your skis facing straight down the hill a few metres back from the edge. Head straight for the lip and just before you go over pole plant and start a hockey stop turn, retract both legs and turn in the air ready to land in a stop position on the slope. This sound complicated but it’s just a hockey stop (in the air!). When you land make sure that you face down the hill with your weight over your edges, this will ensure that you stop in a straight line and don’t bounce over the top. You can practice the air turns over smaller bumps with varying amounts of turn. Finally if there is a lot of powder underneath the cornice then if you land side ways you will face plant. Therefore we need to just head straight over the edge, just ski towards the edge with a little speed and then jump over the edge retracting your legs into a compact position. Then extend your legs for the landing and bring both your arms forwards and do a double pole plant to stabilise the landing. This type of cornice entry does require a little speed, basically the faster you go the softer the landing will be (Have fun!). Finally trees, trees come in all sorts of densities from almost open glades to dense forest with roots and all. The main problem for skiers is speed control because our skis are longer than snowboards we can’t just flip the board side ways to kill a bit of speed. For this reason I would recommend you start with a slope that you could straight line if you had to. When skiing in trees it’s a good idea to take your hands out of the loops of your poles in case you snag a pole. Also goggles are a good idea to protect you eyes from branches and I also wear a helmet all the time now, snow is soft wood is hard. Back to the fun stuff skiing in trees is great, especially on a powder day when the visibility is bad. The secret to skiing tree successfully is not to turn too much, just weave your way trough. If you are picking up to much speed do four or five turns and then look for a space to do a stop, then start again. 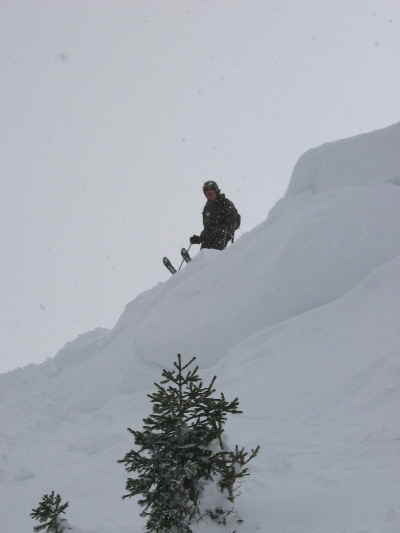 In some resorts when the snow is very deep you can get a well develop underneath a tree. This is a deep hole made out of snow and can be up to two metres deep. In some extreme cases people have died in the holes because they can’t climb out, each time they try the snow just falls on top of you. I’m telling you this because there is a very simple solution that if you don’t know you might not think about it in a panic. Make a ladder out of your skis, put both skis up the side of the hole with you poles across the binding and climb out, simple but it could save you life.